Your health and wellness depend on your ability to balance the bills, family matters, kids, relationships, deadlines, business trips, and other people’s problems on top of your daily routine. And not to forget, you need to eat well, exercise, and get enough sleep to do it all again tomorrow. With so much going on in your daily, weekly, and monthly routine, stress and anxiety can quickly begin to compromise your health, mood, and overall wellness. Just as life can get chaotic and busy, it can (and does) get calm and slow down. It is in these slower moments that there’s an opportunity to regain your balance. Sometimes it’s yoga, reading a book on the beach, getting a spa massage, or better, heading to a wellness retreat. Below, the Foot Palace team discusses the benefits and types of retreats designed to help you relax, recover, and reset so you can get back to peak performance. Refuge, seclusion, and privacy are all words attributed to “retreat”. Wellness retreats offer a safe place for slowing down and rejuvenating mind and body. 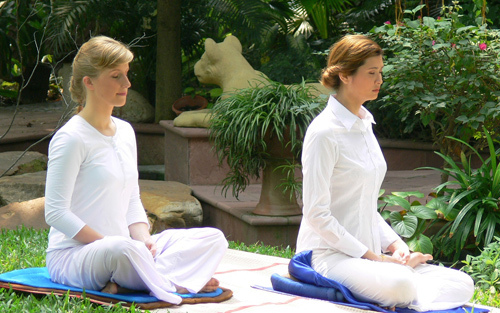 Stress Relief – The most important benefit that any retreat can offer is the reduction of stress. Stress affects us adversely in a number of ways which in turn can lead to your health being negatively impacted and compromised. “Everyone feels stress in different ways and reacts to it in different ways. How much stress you experience and how you react to it can lead to a wide variety of health problems — and that’s why it’s critical to know what you can do about it. Focus and Balance – Before you can effectively cope with everything on a daily basis, you must first prioritize and create harmony in your personal, professional, and romantic life. A retreat can help you regain focus and balance by allowing you to step away from routines and responsibilities; thus allowing you to reconnect with your inner silence and peace. Me Time Without the Guilt – The time spent at a retreat is scheduled “me” time. You do as you choose without feeling guilty about it. Paint, sleep, write, exercise, this is your opportunity to reconnect with yourself and make sense of where you are on your life journey. Wellness Retreats Customized – In the majority of cases, the retreat you choose will offer a selection of package deals, allowing you to indulge and experience as much or little as you desire. These facilities aim to please and often welcome requests or accommodations (within their ability) to ensure your happiness, wellness, eventual return, and good review. As the wellness industry has grown in the Western world, so to have retreat options. Outlined below are a few varied suggestions that offer an expansive and diverse retreat experience. Mountain Trek in Tecate, Mexico – Situated on the Rancho La Puerta in Tecate, Mexico, Mountain Trek is a prime location to de-stress and detoxify. Whether you need time to reflect or take a scenic nature hike, you will be far removed from the daily stressors encountered at home. Chakra Retreat in Ocotal, Costa Rica – Located upon a two acre hilltop above the beaches of Ocotal and with incredible scenery including volcanic mountains and the Gulf of Papagayo, this Villa is home to a luxurious women’s retreat. If it’s a pampering getaway with healing and restorative workshops you seek, this is your destination. Blue Heaven Resort and Spa in Boone, NC – Nestled in the amazing Blue Ridge Mountains, Blue Heaven offers affordable packages for the adventurous and those seeking to simply relax. Spa treatments, meditation, yoga sessions, and much more await in the mountains of North Carolina. Harbin Hot Springs in Middletown, CA – Among the oldest of California’s hot springs, Harbin Hot Springs is situated North of Napa Valley and offers the ultimate “digital detox escape”. You’ll find that their no phone and internet policy will greatly contribute to your ability to de-stress and rejuvenate. With daily yoga and meditation, you’ll find that shedding your troubles in this setting will be easier than you think. Your ability to be productive and make an impact demands that your health and mental wellness be in top form. Your health and State of well-being depend on your ability to effectively balance you are a professional, personal, and emotional stressors. At times, a retreat is the answer to maintaining that balance and restoring your harmonious state. It is the opportunity to separate yourself, reclaim your inner peace, shed any stress, and regain your balance. Because your mental and emotional well-being dictate your quality-of-life, they cannot be overlooked or ignored. Set aside some time and plan a retreat – you and your loved ones will thank you.